UPDATE: I did this from my phone, and now viewing it on the computer, I realize just how hard it is to see the CITGO sign in the background. The Shell station I'm at is selling gas for $1.55/gal. 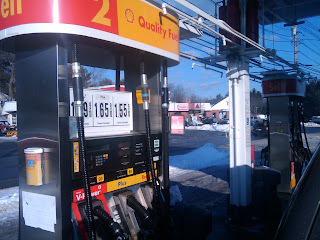 Just across the street, the CITGO station is selling gas for $2.65/gal. Understandably, I'm at the Shell station. I don't purchase gas from Citgo because it is owned by the nation of Venezuela ( http://www.citgo.com/AboutCITGO.jsp ) and I have no desire to enrich Hugo Chavez while the people of Venezuela face ever more difficult times. Interesting side-note: M. King Hubbert, a Shell Laboratories geophysicist, was the originator of the Hubbert Peak Model, which evolved into the Peak Oil Theory. My dad once worked for Shell, too. I was assuming that the Citgo price sign wasn't changed to reflect new prices due to laziness, but now that you've reminded me about Chavez, it could be that Citgo is keeping their prices high because he doesn't want to face a coup back home. I don't think that strategy is going to work.